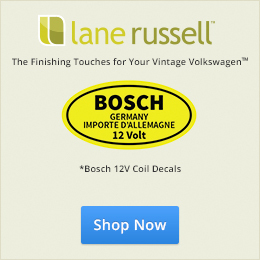 These are the One Year Only parts we carry for the ’67 Beetle over at Lane Russell. You can add items directly to your cart from this page and check out via our shop. We also carry a large selection of parts for other Beetle years and Buses as well! Let us know if you have any questions! Lane Russell is a vintage Volkswagen restoration workshop located in Decatur, Georgia, owned and operated by Eric and Amanda Shoemaker. We have a background in visual design, photography, and technology… and a passion (some call it an obsession) for the vintage Volkswagen. The early stages of our company began when we set out to help fellow vintage VW owners by creating 1967beetle.com. After several years of writing and connecting with Volkswagen enthusiasts around the world, we realized the demand for quality parts & accessories. With a keen eye for detail and an appreciation for hands-on craftsmanship, Lane Russell was founded. We offer the highest quality parts available for your vintage VW Beetle & Bus — including OEM, German, and NOS, with a focus on unique, period correct accessories.